Electrical Contractor in Charlotte, NC | Mister Sparky by Wise Electric Control Inc. Here at Mister Sparky by Wise Electric Control Inc., we offer reliable, trustworthy electrical services to our valued clients. Since we want to help you get the best deal on our services, we won’t charge a travel fee when you download this coupon!
. 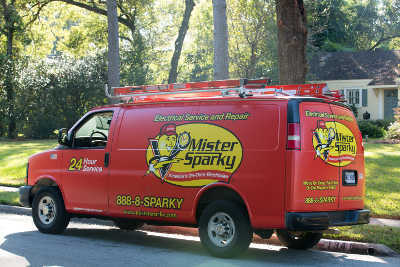 At Mister Sparky by Wise Electric Control, Inc., we are committed to providing you with top-notch, on-time service any time you have an electrical concern. The catch is that you can’t just put off having quality electrical wiring or avoid using your outlets and light switches! At Mister Sparky by Wise Electric Control Inc.
At Mister Sparky by Wise Electric Control Inc., we know that having power at your home is an important part of what keeps you going each day. If you require electrical services for your home in Charlotte, North Carolina, whether for the installation of new electrical equipment or the repair of existing equipment, we can help. Claim a Free Fire Extinguisher with Your Next Smoke Detector Purchase! This year, we are delivering coloring books to all of the children spending time indoors because they cannot be at home, and we want you to have one, too! Your time and the sanctity of your home are important, and Mister Sparky by Wise Electric Control Inc. is unlike any other electrical service company you’ve used. It’s the small things we do that end up making a BIG difference for you. At Mister Sparky by Wise Electric Control Inc., we believe your safety is critical. So, even if you have called an emergency electrician, there are several important steps you should take in the event of an electrical emergency. At Mister Sparky by Wise Electric Control Inc., we’ll work to exceed your expectations when you need an electrical contractor in Charlotte. First and foremost, we respect our customers’ time. No questions asked. We are forthright and truthful in our dealings with customers, employees, vendors, and other stakeholders. We keep our promises. We adhere to all governing laws, regulations and ordinances that pertain to the electrical industry as prescribed by federal, state, municipal and county governments. We practice proper financial and accounting procedures in accordance with all laws governing a privately held business. We maintain a clean, safe, respectable and reputable place of business that reflects the high standards of the Mister Sparky by Wise Electric Control Inc. brand. We support each member of the team to strengthen the brand and build successful, long-term relationships. We value fair competition. We advertise, promote and market our brand fairly and accurately and in a manner that reflects the high standards of the Mister Sparky by Wise Electric Control Inc. brand. Our electricians are experienced and professionally trained, which means we will work to exceed your expectations. Your complete satisfaction with our electricians and our service is 100% guaranteed. It is the Mister Sparky by Wise Electric Control Inc. difference that keeps you, our customer, happy and satisfied. We fix the problem right the first time and provide our customers with convenience, courteousness, competence, cleanliness and character. You are our number one priority, and we are determined to provide an experience that exceeds your expectations for all your electrical services. That’s the Mister Sparky by Wise Electric Control Inc. promise! Contact Mister Sparky by Wise Electric Control Inc.
Our high-quality electrical products and electrical services, as well as our skilled technicians, will give you confidence that your electrical needs have been well-met.